There is seemingly an infinite combination of choices to make when building a new application. 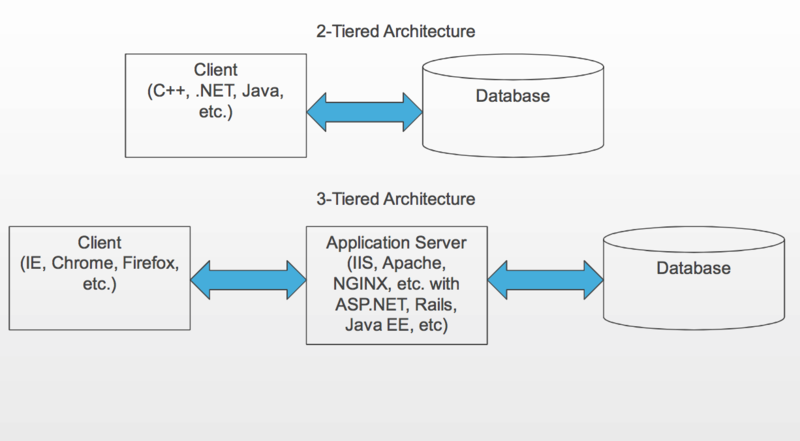 One of the most fundamental choices is whether the application will use a 2 or 3-tier architecture. This choice really comes down to whether to split out the business and data logic into a separate tier. For web applications the decision is made for you. However, when building a stand-alone application there is a choice to be made. Of course the relative importance of each consideration varies based on the application’s target uses and environment. As can be seen from the following table, a 2-tier architecture has some compelling advantages. Although any of these points can be argued and some come down to subjective preference, there’s no arguing that 2-tier applications can be easier to build and cheaper and easier to deploy. However, when the Internet is involved, the performance of a 2-tiered application can suffer. Because more data needs to be transferred to the client in a 2-tiered architecture, the speed of the network can have a significant impact on the performance of the application. While the speed and performance of the network has been a limiting factor in the past, installing NitroAccelerator on the database server and clients allows 2-tiered applications to run at speeds comparable to local area networks making this option a serious one that warrants some consideration. Read on for a relatively high level view of the design considerations and arguments. In the next blog post I’ll explore the optimal settings for building and running 2-tiered applications to maximize performance over the network. Security The topic of security is a tough one because arguments can be made either way for 2 vs. 3-tiers. In my experience, the 3-tier architecture has the potential for better security, but if great care isn’t taken during development it frequently ends up less secure. With a 2-tier approach, the application authenticates to and communicates directly to the database, which simplifies the attack surface area and is one less boundary to be concerned about. Depending on the details of the application server, there could be, for example, many complex REST APIs that could each have their own attack weaknesses. This one topic could be covered in a book, so I’m simply calling this one in favor of 2-tier even though direct access to the data sounds unsafe. Even though 3-tier has the potential of greater security, I’m calling this one in favor of 2-tier. I’m always interested to hear your point of view and considerations. Check back for an ongoing series about application architecture options, performance and more. Please fill out your information below to receive your install resources. - Please Select -Improve performanceReduce network congestionDefer bandwidth upgradeEnsure encrypted network trafficAll of the Above!